A special focus of the IM Foundation was setup to research the key projects and stories of each stage of Inge Morath’s career. Like many of her colleagues, Morath used her frequent magazine assignments as springboards for what she referred to as her “personal work.” Much of this work, having been published in the 1950s and ’60s, remains out of print and little known. Working closely with Magnum Photos and the publisher Steidl, since 2007 the Foundation has released three major publications and related exhibitions. Combining photographs with archival materials and scholarly texts, each considering a different aspect of her prodigious work, these and other projects in progress represent a full-scale reappraisal of Morath’s contributions to the field of photography. Inge Morath: The Road to Reno (see slideshow), published in ’07, brings together Morath’s photographs and journal writings to tell the story of her first road-trip across the US, with Henri Cartier-Bresson, en route to the film-set of The Misfits in Reno, Nevada. The book was awarded the “Schönsten Bücher 2007” award from the Stiftung Buchkunst, Berlin. 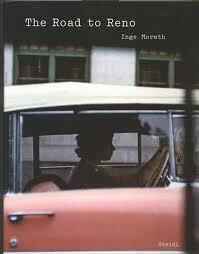 In 2009, Steidl published Inge Morath: Iran (see slideshow) and Inge Morath: First Color (see slideshow). Inge Morath: Iran is an in-depth look at a single story by Morath, employing a variety of archival materials and with texts by writer Azar Nafisi and curator Monika Faber. Inge Morath: First Color, published in conjunction with an exhibition at the Magnum Photos Gallery in Paris, presents Morath’s little know color work from the 1950s and ’60s, with an essay by historian Mary Panzer. Selected documents and texts from these research projects are presented here, in conjunction with slideshows which both exemplify and, when useful, reconstruct the original sequences of Morath’s stories. Current projects in progress include the first in-depth publication of Morath’s photographs of refugee camps, with actor/photographer Yul Brynner, in Europe and the Middle East (1960), and a substantially revised publication of Morath’s and Arthur Miller’s Chinese Encounters (1979).